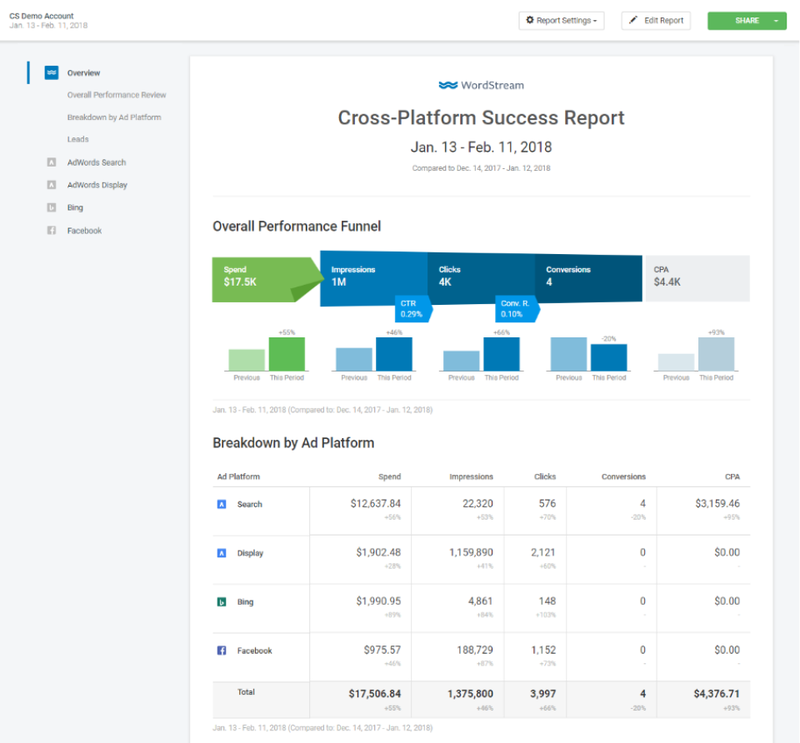 WordStream Advisor makes online advertising easy: You can create, optimize, manage, and measure paid search and paid social campaigns cross-channel in as little as 20 minutes a week. 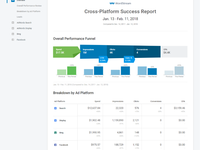 WordStream's cross-network capabilities allows you to create and replicate advertising success across three channels; Google AdWords, Facebook, and Bing. With a proven track record, our software on average has helped customers increase their click through-rate by 44% and conversions by 30%. WordStream Advisor Reviews Recently Reviewed! Pros: I new very little about Googles adwords and after about 4 months of trying it on my own I new I was going to need some help. I needed to turn our eCommerce sales around much faster than I myself could do. So I did some research online and came across Wordstream. I did the free trial and quickly realized this is exactly what I was looking for, it could split my keywords, show me the best keywords, what keywords where good for my ad and not good for my ad, it showed me what ads needed work, where I was spending to much money, where I wasn't spending enough money and so forth. Now 4 months later i have tripled my eCommerce sites sales, no joke! I never went to school for adwords, I new nothing about adwords when I took over this project in September of 2016. I even get my own account rep that will answer any questions I have, and believe me I had hundreds. Alasdair Johnstone was able to provide me the type of support I required and he was quick about it. Knowing that I had that support I required really gave me the confidence to tackle this project 120 percent. I have monthly meetings with Ali and he goes through my entire account teaching me new techniques each and every time, he sends me an email explaining everything we did so I have a reference on how to do it on my own. I have yet to be steered in a direction I feel uncomfortable with. I cant thank the Wordstream team enough and my rep Alasdair Johnstone enough. Overall: Simply put I got a crash course on how to use google adwords without having to take college classes. Money well spent! Pros: The 20 minute workweek is helpful to get things going. The dashboard gives a nice overview of where things are headed. And the GUI is helpful because of the presentation of data. It's simple and has no clutter, where as Google is going in the opposite direction. Wordstream is extremely useful when optimising for clients with smaller budgets, but still need incremental improvements with only a small amount of time. Also - Wordstream is ideal for new colleagues to get the hang of doing AdWords. So, it's also some sort of e-learning environment. The focus on cutting costs and improving quality scores and CPA's is great. It's real easy to add negatives from the Query Stream to multiple ad groups at once. The software comes with some nifty features to easily see improvements that can be made. Finally, Wordstream is very actively improving the software and adding features on a almost weekly basis! It's moving towards display and social advertising more, which is important! Cons: The 20 minute workweek becomes less helpful when optimising bigger, complex campaigns or already tightly managed campaigns at this moment. I also miss the option to segment data by conversion type for example. Or the compare different periods other than on the dashboard. So in some cases I need to go back to the Adwords GUI for that. Maybe Wordstream could add more features or specific reports to focus more on things that matter most when lowering CPA, cost in general or improving CTR. Overall: A more pro-active workflow for smaller clients without blowing up the budget for managing them. Also a great environment for starting specialists to get to know adwords and how to focus on cutting costs and lowering CPA's. Pros: I really like the 20 minute week feature. It's not telling you anything you couldn't already do in Adwords pretty easily but the interface, process, and routine of the tool ensures that I never skip over the weekly basics needed for management of a paid search campaign. Cons: The reporting feature use to have some more predictive narrative text that they've done away with and I really miss that - even though the copy wasn't always super informative, it was always a quick cut/copy/paste into a client report when introducing some data. There are some inconsistencies with the reporting when you create a certain FB or Google campaign type in FB or Google (rather than creating them IN Wordstream) - which can be frustrating because there isn't any warning on the WS end that the data might be inconsistent. Overall: I am I one person shop for digital marketing services. A major part of my business is digital media planning, setup and management. Wordstream makes the management and reporting of my client's Google, Bing, and Facebook ads campaigns much easier. Pros: How simple it makes Google Adwords. For a system that should be easy for a business owner to use, Adwords is overwhelming. Wordstream's software is easy to navigate, changes are simple to make, improvements to your ads are done, step-by-step, often better and quicker than ever possible through Google itself. Cons: There a lot of great functions within the system, however, without someone helping you find them, they can be lost on the average user. That said, with counselling, you will find these tools invaluable, once they are explained. Overall: I started with Google Adwords in September 2016 with the highly competitive market of online floral orders. After multiple calls with the Google Adwords Advisors, I found out that they had set up the account incorrectly, and with their mistakes, I was spending thousands of dollars with no results. I had been following Wordstream through Facebook, as we set up the account, and found their webinars and blog postings were more helpful than anything I found through Google itself. In December 2016, I took the plunge and called Wordstream for help. As a small business, paying for their services seemed like a stretch for my already overspent advertising budget. However, in only a few minutes of the intro call, I knew I had to make the change. Within weeks of signing up with Wordstream, and working with my rep, Betsy, doing all my 'homework' and generally watching the account more carefully, and better informed, I saw instant increases in our online sales. This February, we had a record year in online sales and continue this growth month after month. I have already started working with my second business to create Google Ads to increase its online bookings, with the help of Wordstream. For anyone considering this, I would say, go for it! You will thank yourself over and over again. As a small business, I know we wouldn't be where we are now, without their ongoing support and assistance. Recommendations to other buyers: The 20 minute work week gets a little monotonous in time. Sure there are steps you can evaluate week to week, but it would be helpful to get 'challenged' (if that's the right word) to improve your account beyond negatives, adding keywords, and other simple tasks. I have found that now that the account is active and well designed, it would be good to know how to expand beyond the normal ongoing campaign management. Pros: Wordstream handles the large PPC channels like Google AdWords, Microsoft Bing and Facebook advertising campaigns. This is a big advantage as you don't need to use multiple tools to handle ad campaigns on different PPC channels. Wordstream helps you automate the PPC management process and employs machine learning / AI helps you analyse the campaign data quickly & feed you with actionable one-click fixes or optimizations. this reduces the time taken in mundane data crunching and optimization of campaigns - this frees up more space for strategic thinking on the campaigns. Cons: It's too expensive, to begin with - way out of the league of small businesses and agencies. The business needs to be highly profitable or you should be running an agency that charges well. Another drawback is that it is not for beginners - you need to know PPC and each of the channels in great detail to make use of the platform to make your PPC process efficient and profitable. Also, the tool can other channels like Linkedin, etc - which is an important channel today. I haven't taken the help of the Experts & paid more - can't comment on that part. Overall: One stop shop for managing PPC to save time & make more money. Pros: The 20 minute work week has made my time navigating PPC menus infinitely more impactful. The Wordstream software allows me to optimize, add or delete features from each individual campaign quickly and efficiently. Cons: The only negative I can think of is the lack of support for other platforms. Most marketers stick to Google and Facebook so most other platforms are generally a waste of time so this isn't a huge issue. Overall: Wordstream allows my team to quickly plan, execute and manage PPC campaigns. From simple Facebook promotions to complex A/B testing Google AdWords campaigns, it's easy with Wordstream. Pros: I like the dashboard, ease of duplicating campaigns to Bing, the Querystream and keyword builder. Overall: Campaign reviews, keeps me on budget for AdWords and simplifies Google ads. Pros: The 20 minute workweek really does simplify PPC optimizations. It provides priority suggestions weekly that I implement early Monday morning that allows me the rest of the week to manage individual campaigns. We have a rather large account on Adwords & Bing and it has always been way too difficult to manage by myself in the past. With Wordstream, I can implement changes with ease to both our Bing & Adwords accounts in bulk. Between the Wordstream assistance creating expanded ads, the easy to identify improvements and ability to copy/duplicate new changes over to Bing has been a game changer for me as a PPC Marketer. Working with agencies have never benefited my company in the past as we have a unique niche in the online world. Wordstream has removed my need for additional assistance and we've watched our metrics improve greatly in the short 4 months we've been with Wordstream. Cons: There's always room for improvement. It would be nice if we could copy existing campaigns/adgroups/kws/negative KWs over to Bing. Currently, it's limited to offering that suggestion to copy only new changes we implement. Would be nice to have a little more control over the 20 minute workweek suggestions and tailor fit to our business needs, but it's still better than anything else I've seen. Overall: Easy to use management of Bing & Adwords. Simple and accurate weekly optimization improvements through 20 Minute Workweek. Pros: By using the 20 min workweek process, I'm able to prevent wasting our marketimg bugets (in the advertising itself and by saving my own time) since the 20 min work week stream lines everything for me. The software also combines multiple platforms and accounts so that I can handle them all in one place and we're able to make simultaneous changes across each platform at once. The time I'm saved alone outways the money spent on the program itself. My consultant is extremely proficient on the software and has amazing marketing ideas of her own on how to increase not only my click through rate but to close the sale. This is the first company I've worked with that actually took the time to understand what my business is and what I'm selling. Being a business that sales to a specialized audience and really can't be categorized into one box or another, this makes a huge difference. Cons: The only downside I can see about this software is that there is still a learning curve involved in understanding how it all works. The pay per click advertising is not a simple one step method. There are multiple factors that come into play which means constant changes and monitoring but that's truly more about the paper click advertising itself versus the software offered. Overall: This software simplifies paper click advertising in order to save time and money. Pros: I want to say everything. I was very new to PPC when our company signed on with WordStream, but the tool makes it so simple to just plug in and go. That, combined with a very knowledgeable customer support rep, makes planning a PPC campaign a lot easier. I've been able to see where we were overspending and I've been able to really optimize to drive traffic/ get our customers quality leads. WordStream has saved me so much time so far and I believe our clients will continue to see the value it provides. Cons: I really don't have any complaints. Everything on the backend is never pushed lived until you actually click the button to push it live. I will build out a full campaign and then completely forget to push the button. It'd be cool if there was a pop-up reminder or something along those lines. Pros: The thing I like the most about Wordstream is two-fold. First, their customer service and support are topnotch. 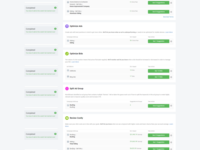 Additionally, the Workbench inside of the software itself makes it super easy to review and work on multiple campaigns across different channels all from one space. Ultra convenient, and ultra effective. Cons: The thing I like least about this software is that it forces customers to manually sync up any changes to ad accounts to make them live. A way to auto-update at certain intervals or add an option to select whether or not this occurs would be helpful. For example, let's say you spend a bunch of time working on campaign optimization tasks in Wordstream, and then forgot to hit the push to live button, then you could potentially miss out on the benefits those optimizations could provide because you forgot to sync platforms. Now, it's a pretty easy fix to make sure this function is part of the overall account management workflow, but still worth mentioning. Overall: Overall, our experience working with Wordstream has been very positive. The platform itself is very very good, and the team that supports your use of the software and overall advertising goals is really best in class. Pros: Simple to use interface with analysis of the ad campaigns base on data metrics. Also is great from an organizational perspective to help ensure all clients are being worked on regularly with alerts and last day worked on the campaign field which is in the main dashboard for all clients. This serves me well as a digital marketing manager of an agency. Good reporting template as well! Cons: Can only do about 80% of the tasks that can be done in the Google and Bing Interfaces. Thus part of ongoing work has to be done directly in the main interface. Overall: Helps from an organization and reporting perspective. 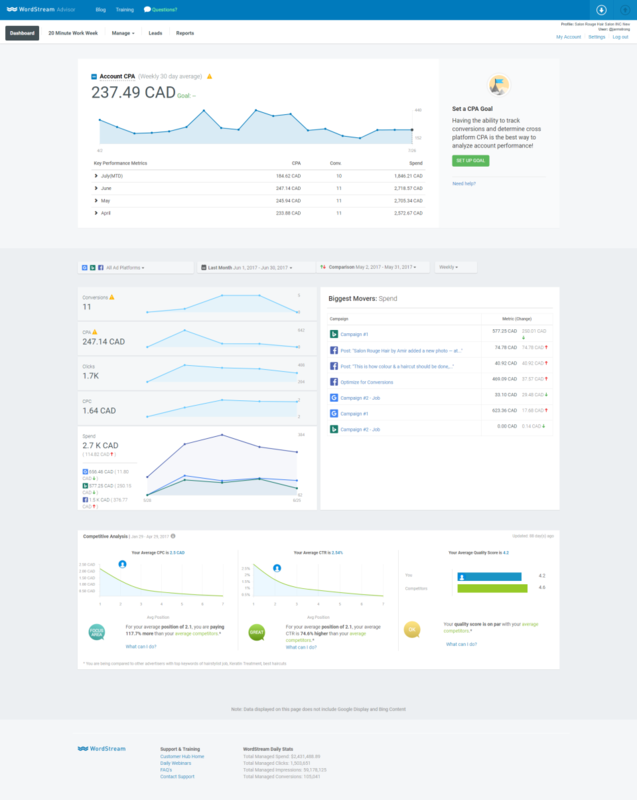 Pros: The intuitive layout of the UX/UI dashboard is second only to the value that the Querystream function provides in daily optimization of both our Google Adwords and BING accounts. We've probably saved about $50,000 over the past 6 months and our CPA has steadily dropped over time,... and still dropping. Can't say enough good things here. Oh, and only spending about an hour a week managing it is pretty sweet too! I should probably mention that their customer service and account management team is top notch.... we got our site suspended with Google Ads over a minor issue (no one's fault, just Google being Google),... and their team stepped in and ironed it out with the big G within 24 hours. They simply bring resources to the table in dealing with this world, that you don't find anywhere else. Overall: Ease of use in PCC management. Pros: This is a powerful tool to create and manage your Adwords bidding. optimization tools so you know which words are performing and can adapt your ads accordingly, negative keywords which alone is a huge value, and the intelligence that it gives you to manage Google. Many competitors have tools that are overwhelming and lose you in the details, and you'll find this by managing Google Adwords without Wordstream. It streamlines and simplifies as best it can a process that is confusing and costly. Cons: I like the basic toolset, but once you get beyond that the challenge, like all Adwords platforms, is managing the diversity and complexity of details. Ad integrations with Google, Bing, and Facebook are good, but more would be helpful. Display ad support is not a strength here, mostly keyword support. Reporting is also a bit all over the place for me, so I rely on other sources to get my reports that share relevant data. Overall: There's a huge gap between those with enough money to spend on Adwords - like $10K a month to get a decent agency at least - and those without. Wordstream fills that gap with a strong solution that will allow you to focus on keywords, learn, adapt, develop creative, and even get premier consulting which is a valuable way to gain professional insights without having to contract with an expensive agency. It's an excellent tool if keywords are your game, especially with Google and Bing (Facebook is not a keyword play, and while the tools are there, there are better tools). WordStream Advisor will really help you dial in your Google pay per click marketing campaigns! Pros: Once you have your basic PPC campaign(s) setup, WordStream Advisor will analyze everything and then make suggestions for budget changes, ad changes, keyword changes, ad set splitting and most importantly, negative keywords, on a weekly basis. You can then review their suggestions and accept them or not. Two big things that I have noticed is my "Google ad quality score" has risen across all my ads and my actual cost per click has decreased as well. This software is very easy to use and also will work with your Bing and Facebook ads too. You really can't go wrong with this software if you run PPC ads on Google. Overall: 1st off Wordstream advisor saves me and my team a ton of time trying to figure out how to optimize our PPC campaigns. We manage multiple PPC campaigns for small business owners (we are an agency) and any tool that saves us time which saves us money, and we appreciate that. We will use this software as long as we manage PPC campaigns. My team & I are very skeptical with any software that we purchase and use, having been burned numerous times by over-hyped promises on software. To be honest, I can't really find anything that I dislike about WordStream Advisor. It does it's job, is easy to use & saves me and my clients money and headaches. Pros: As a one-person marketing agency, I always envisioned harnessing a software that allowed me to get into the weeds of my client's adwords accounts easily, keep me updated on their budgets, and allow me to do audits and account re-structures quickly. WordStream is just that. I love the 20 minute work week, as it allows my to get all my account maintenance out of the way for the week on Sunday/Monday and I have the rest of the week free for meetings, building new campaigns and anything else that pop's up mid-week. It's also made upsells to clients on Facebook ads very easy as the integration is very simple/easy. Cons: I mean, it's not perfect. There's some work flows that you need to get used to, but in the end I feel like I've gotten more than fair value for my subscription fee. Pros: There is an abundance of really powerful tools that help drive up conversion rates. The FREE tools like adwords grader, Facebook Ad Performance Grader, & the Landing Page Grader offer free & insightful advice for optimizing your ads and landing pages. Add in Keyword Tool & Facebook Opportunity Calculator and you're sure to look like a superstar to your boss. 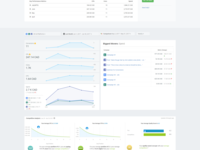 The Paid platform is even more robust and will push your online advertising performance through the roof. Cons: The paid service is a tad pricey and may be so much so that it is out of reach for some smaller budget brands. While the benefits definitely outweigh the cost, SMB's may have an issue affording it. But at east the free tools still work great! Overall: We were able to drive up click-through traffic rates and conversions by about 20% the first month we used the paid tools. Pros: The ability to manage dozens of Adwords tasks, get intelligence, and actionable items in just a few minutes are very good. Making rapid-fire changes to accounts is easy. The features and interface are always evolving. Cons: I'm not a fan of their Facebook Ads management as I am a more advanced marketing person but the insights they provide on ads I make with other tools are good. Overall: I am able to manage dozens of AdWords accounts and get insights quickly. Pros: Wordstream is like doing almost everything for your campaigns, it helps you optimize your Google Search and Facebook display campaigns better. I like the fact that it recommends working keywords to be used and is always updated. it also tells you if the keyword is negative. The reporting dashboard is amazing, in my entire career of being the campaign manager I have never seen the platform that gives you recommendations in words after showing you campaign performance in graphs. Cons: You can't run Google Video Campaigns on it yet. Overall: It saves us the time of researching popular keywords on the search engines by compiling best performing keywords and recommending them to be used for our campaigns. It analyses the campaign performance data for you thoroughly, making your work easier. It has been extremely easy to use and I have definitely gained benefit from it. Pros: I like that I can access nearly everything from this platform. The 20 minute work week is a life saver as it lays out suggestions for my campaigns. If I have keywords in multiple places it lets me know or if I have a bid too high/low, or if an ad is underperforming. It also shows me best practices, where I need to improve, and how I can do that. Cons: I do not like that I can not access my ad extension through this. It tells me what needs to be fixed/added but I have to go through ad words to do this. I also have my businesses set up as different campaigns instead of accounts. It doesn't effect me too much, but it was a little difficult in the beginning. Now that I know what I need to see for each one, it's not an issue. Pros: The 20 minute work week is at the core of our PPC management. It is so easy to go in there and see 20-100 suggestions about what you can change in your PPC accounts from negative keyword ideas to keyword addition ideas. Wordstream also monitors for budget changes and alerts you via email if you're not reaching your target budget. Cons: Display ad support and suggestions are limited. Would also love to incorporate our CRM into the reporting (Hubspot / Salesforce) as our actual lead numbers and conversion numbers are often different so I have to manually adjust CPA / conversion rates to be the actual numbers. Does what it says it does with excellent customer service and awesome expert advice. Comments: We debated for several years over whether to spend money on the Wordstream software in addition to our Adwords spend. Our ad spend is currently pretty small at between $1,500 - $2,000 per month. We knew we were wasting money in Adwords, because we "kind of" knew what we doing, (translation - we didn't know at all), but we didn't realize how much of our budget was being wasted before signing up. We have only been working with Wordstream for a few months so far, but our cost per click and cost per acquisition have decreased dramatically. Monitoring results has also become easier. We are more than paying for our Wordstream costs with Adwords savings. Our PPC account is more targeted and effective than it was going it alone. The Wordstream people regularly update and improve their software; we've seen them ad Bing support and now Facebook Ad support which lets you modify and monitor all three platforms in one place. For us, one of the most valuable parts of our Wordstream experience has been their Premiere Consulting Service. It's a pretty inexpensive add-on for what you get, which is a once a month phone call and expert advice. Our consultant, Navah Hopkins, knows the software inside out, but also knows a lot about Adwords, Bing and Facebook, and online advertising in general. She's good at spotting areas in our account that need improvement and she makes solid recommendations based on the type of business we have and our business goals. It's a big value add for a small amount of money. We would advise anyone signing up for the software to spend the money to add Premiere Consulting. I loved working with Wordstream. They led me through a maze of online marketing like pros. Pros: The customer support had to be some of the best I've experienced in the 13 years I've been doing marketing. I was greeted with a mailed welcome card and gift card to Starbucks, then, was setup with a specialist who began teaching me all there is to know about AdWords and how to succeed in that sphere. They are a gold or diamond or something vender with Adwords, which means they are hyper-focused on knowing everything there is to know about that marketing venue. Cons: The interface was very complicated. I'll give them credit for trying to make AdWords interface make more sense, but I still experienced vertigo from the multitude of navigational options and sections of AdWords through WordStream. Overall: Thanks to WordStream, my knowledge of Google AdWords and running successful campaigns has grown leaps and bounds. The bite-size conference calls helped me to digest learning at a pace I could handle, and the customer support was phenomenal. Wordstream helps me achieve higher quality AdWords accounts for my clients. Great reports as well! Pros: The 20 minute work week tool is great for quick maintenance items. The performance grader report helps to dig a little deeper into best practices and helps me to spot areas of improvement that I can take care of quickly. The many keyword tools available are great at helping me to make large scale changes quickly and I can review my changes before posting them to AdWords. Call tracking and keyword level call tracking are a must for reporting new leads to my law firm clients. I also utilize the landing page builder and contact forms with great results. Working with an account rep who has experience with my target clientele has been a tremendous benefit to my company's growth. Great looking white label reports that I can customize for each of my clients communication styles makes my weekly phone calls that much better! Cons: There are still a handful of features to be added into Wordstream that I think would be nice. Support for shopping, display and YouTube campaigns will be great once they are added. Overall: Increased quality of work! Makes my job easier and allows me to meet more customers needs. Pros: WordStream opened up an entire new business opportunity to me. Without it I wouldn't have the time or inclination to sell PPC management services on a large scale. Now I can offer AdWords, Bing and Facebook ads as an intro or add-on service for my clients. Without needing additional resources. WordStream changed my business. Cons: The one area I would really like to see improvement in the software is in the reporting functionality. The current reports are a good start but fall short when it comes to what I need to provide my clients. I recently attended a live WordStream event in conjunction with Google and spoke with a team member who is actually working on new reporting features. What he could tell me is exactly what I've been looking for. Needless to say I'm very excited about the upcoming release. Overall: The 20-Minute Workweek guidance has been invaluable to me. I was a novice at AdWords management when I began using WordStream but I was quickly able to make some dramatic improvements for a client which allowed me to open that service to several other clients. WordStream changed my business. Pros: Wordstream makes ad campaigns so much easier to edit and work in than Google Ads. Our Client Success Manager is ready to help any time. I know I can always rely on him for education and advice. The Implementation Team is far above any other I have ever worked with. They are willing to work on any connection issues with you and teach you how to fix the problem during the process. I cannot say enough positive things about Wordstream. I hope I never have to do my job without it! Cons: My account has had a few issues connecting to the Google API when updating bids but my support manager looked into and provided a solution with manual bidding. Overall: When we started wordstream we were spending just under 1000 dollars a month and getting little to zero leads. Today we are getting high quality leads every week and spending close to 800 dollars a month. Easy to use. Great Customer services. Couldn't be happier. Recommendations to other buyers: Make the minimum cost er month for consulting lower. I wish I would have started using WordStream years ago! Pros: Dashboard with information about all campaigns. Great reporting capabilities. Push changes live to Google Ads. Recommends weekly changes to all active campaigns to increase performance. Stellar customer support and onboarding. Easily create HTML5 ads by inputting your website. See live data from Google on current keyword bids. Create text ads with valuable checklist to ensure better quality ads. Set campaign goals and monitor performance. Better call detail information than Google provides. Record incoming phone calls. Get a notification when a call is coming in from an ad. Cons: Consulting not included in monthly price. Six month start up contract required. Overall: Managing all our campaigns and making improvements easily. Already seeing quality score improvements on our ads. If you don't have hours a day to dedicate to campaigns, you need this program. It's so simple and I've learned more about managing campaigns in the short time I've used it than I learned in years of trying to run campaigns on my own. Great way to ensure PPC campaign success! Pros: As an agency that manages tens of thousands of dollars in media spend each month, we saw a need to use software to improve efficiency, and Wordsteam provides just that. 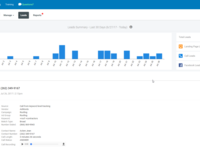 The various features, such as the 20 minute work week, make campaign management a breeze and my team uses this data to dig into more granular campaign details each week. Highly recommend this for PPC beginners and pros. Cons: It is not cheap, but if you use the software often and have enough media spend under management, the cost is more easily justified. Overall: Improved my team's PPC management efficiency and that is crucial to our overall profitability. The Wordstream advisor makes the world of digital advertising a little less confusing. Pros: The platform is easy to use and has a lot of great features that help to keep track of Facebook, Google, and Bing Ads through some easy to understand visuals. Phone tracking was easy to setup and helps us better understand the value of our ads for the sales that don't take place directly online. There is a well documented guide with videos that help explain all the features so questions are easily answered. Cons: A feature that I think would push help the Wordstream Advisor to the next level would be a way to track your total sales within the app. This would help out our company see the relationships that might be missed between all the phone sales and impressions that don't get tracked through the marketing platforms. Overall: This is the best way yet we have found to track our phone sales. Tracking all the platforms we use to advertise in one place also helps us better digest the copious amount of information that comes with internet marketing. Has made my day to day PPC tasks so much easier, and can do so much more. Pros: Wordstream is so easy to use and install and took minutes to set up. Its user interface is very simple and easy to follow, even for a novice. I manage a large account across adwords and bing, and I got wordstream to help manage to two, and since using the software, I have seen good returns for the investment, and my time is used more efficiently. Also, my premier consultant is great, his knowledge has really helped me be more sure in my own knowledge and has helped me with management of the account with some inside tricks. Cons: There are some information which would be useful for people with advanced knowledge which is lacking in part, but after discussion with my consultant I have been assured that all the features I feel are missing are being addressed and should be added soon, which is great to know that the software is getting better rather than just staying the same. More than pays for itself in very, very short amount of time. Pros: Of course, the "20 minute work week", but I also love how easy it is to manage Google, Bing and Facebook ads from one platform. Cons: I wish there were an integration of some sort with WordPress; either a plugin or GTM feature which would allow further collection of visitor data, form submissions and return visitors. WordStream is great for managing paid search advertising accounts. Pros: WordStream allows you to manage multiple accounts in one place. You can connect Google AdWords, Bing Ads, and Facebook Ads to your Wordstream account. You can also have multiple users associated with the account depending on the subscription level. Changes you make to your accounts in WordStream are automatically made to the original account once you post, so you don't have to go back and make the changes there, too. When you make changes within WordStream, for example, to your AdWords ad groups, you can also choose to make the same change to Bing. This way, you don't have to keep making the same changes in two different places if you want to keep both accounts setup the same way. 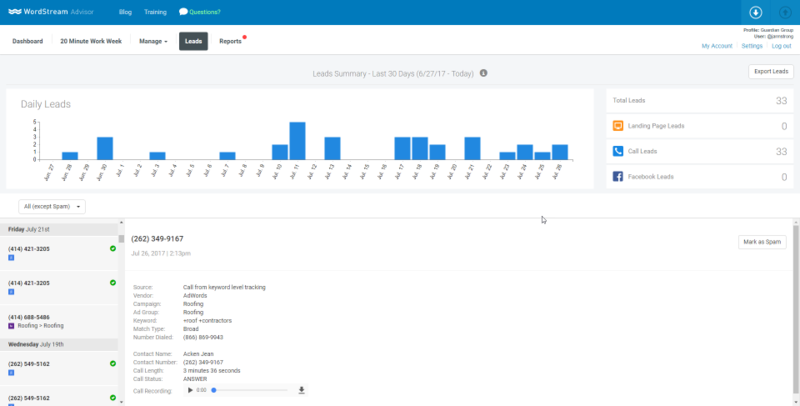 WordStream support is also very helpful, and you also get custom WordStream reports every month. The 20 minute workweek is probably the best feature. Once a week, you login to WordStream and you're given suggestions on how to improve the accounts. Cons: I don't really have anything negative to say about WordStream. If you're looking for an easier way to manage paid search accounts, or if you don't really know why you aren't seeing results you expected, WordStream can help. Greatly increased traffic to the website. Pros: Very easy to use. With the increase in traffic to the website, we get more leads and increase sales. That is the name of the game. Cons: I really can't think of any negatives. Our goal is to increase traffic and make more sales. Effective use of adwords is a must. This product is fast and simple to use. Overall: increased traffic and good leads. Pros: I've been using the system for 2 months, coming off of working directly with Google on our AdWords account for 3 months. The transition was seamless and Google seemed to agree with the system's recommendations for us as we moved onto it. The 20 minute work week is easy and manageable and the reporting is great! There is much more for us to manage aside from the 20 minute work week that's in depth but the service has been wonderful and helping us through that learning curve. There is so much that marketers have to be on top of, sometimes also being the PPC expert isn't a readily available option/focus so smaller marketing teams need a system like this. The people there have been nothing short of fantastic to work with and also seem to want to make sure we're successful with our PPC advertising as well. Cons: I wish the reports could be weekly in addition to monthly. I wish there were slightly more detailed instructions/advice to achieve certain goals through QueryStream and the more detailed portions of the system. Overall, there are no specific complaints, just areas we need to get better at in using the full potential of the system. Pros: SEO wasn't my forte, or even my focus when I first started my job. So when I was tasked with keeping an eye on and managing our various analytics platforms, it was like drinking from the fire hose. Luckily, I came across WordStream Advisor. The system offers a single platform to manage all your ad tracking and analytics. It's intuitive (after some in-depth training) and provided a way for me to simultaneously learn and manage our ad stream. We were pretty scatterbrained before but WordStream optimized all our planning, spending, and result tracking. Love it! Cons: Other than a few nit-picky things (that really have zero impact on my thoughts), there's really nothing I can think of that would be considered a con. Overall: This is a great platform for both new and weathered individuals diving into ads and analytics. Pros: Most of all, I enjoy working with the people at WordStream. We set up weekly reports, but it is the team that I have in place that help cidentify opportunities for growth. They proactively customize reporting to fit the needs of the company. Cons: Sometimes reports can be lengthy and some data is not relevant to our current initiatives. Although this is sometimes a problem, I can always talk to my team at WordStream and customize the report for granular data that is highly relevant to our goals. Have used for 6+ months and have seen tremendous advances in our PPC results. Worth the investment. Pros: For someone like me who is a part of a smaller team (and wears many "hats" at the office) I like the 20-minute work week as it quickly focuses me on what's important to review regularly. I am new to PPC and would consider myself a novice so I find it helpful to have suggestions to understand *why* I should make certain adjustments. Cons: You must pay for premium consulting if you need some direction after on-boarding, but this is understandable. I use this software every day alongside AdWords. Pros: What I love most about this software is the ease of use between multiple brands. Easy way to manage multiple campaigns with limited resources. Cons: What I like least about this software is, it doesn't say what type of conversion the keyword gives you, only that it produced a conversion. Pros: I appreciate how the tool allows me to quickly take care of basic maintenance tasks such as adding negative keywords, pausing/optimizing ads, and adjusting bids. The 20-minute work week feature lets me get through a lot of tasks without taking a lot of time, and for the most part feels more intuitive than working within the Adwords dashboard itself. Cons: I haven't been able to get much use out of the reporting functions other than geo reports, and it's frustrating to have to run that report each time you try to view it rather than it regularly being updated. Also, there's limited functionality for display campaigns, but those campaigns do count against your monthly spend (which means the software cost can be more because it's based on the level of monthly spending). Wordstream has been a godsend and has helped optimize our advertising campaigns! Pros: Wordstream helps track each campaign, notifying us on the suggested changes that need to be made, as well as suggesting a number of keywords to add to our campaigns. Cons: Wordstream doesn't take into account the View-through conversions that Adwords tracks, which would be extremely helpful to track in the future. Overall: We've successfully optimized our advertising campaigns with Wordstream, which in turn has saved us money and helped us attribute our budget wherever needed. Pros: WordStream makes it easy for me to analyse the data and take the right steps and actions to optimize my account effectively. Cons: I wish WordStream could audit my existing PPC landing pages and offer suggestions to make it better. Other than that, I can't fault the platform. Overall: If you are involved in PPC, then WordStream is a must have. The benefits not only come from the software but also the people that work there. If you want to improve your PPC, then WordStream is a must. I highly recommend for use with Adwords and Bing Ads! Pros: I really liked the customer success manager we had to help set-up the system and guide me through how to use it. It made my job managing ads and discovering opportunities much easier and more efficient. Cons: It was just a little pricey for a low-ad-budget user. It's pretty good bargain when you have a moderate to high ad spend. Overall: I've used WordStream to manage Adwords and Bing Ads. It helped us to gain more insight, to refine our ads, to create better and more compliant ads, and to select better keywords and match types to reach our goals. Pros: I like most it's ease to use as well as it's layout making it easy to access and navigate on a daily basis. Pros: I love the suggestions for how to manage my campaigns. The keyword suggestions and bid adjustment recommendations are invaluable. Also, having someone to help with our account is very helpful too. Cons: Honestly, I have no cons that I can think of. The price maybe, but it saves me so much time every week that it is worth it. Overall: The best part is not having to spend as much time working on our campaigns and having more time to work on other important projects. WordStream has made organization of multiple campaigns across multiple platforms a huge time saver. Pros: WordStream points out where a deficiency may be and allows for easy incremental changes of campaigns. Cons: If the WordStream software had the ability to assist with ad creation it would be unstoppable. The software provides suggestions for top keywords and key points that are needed for a quality ad, but automatically providing copy based on the landing page and subject would be amazing. Overall: WordStream is a huge time-saver that does not cut corners. Pros: WS is the most user-friendly platform that I have seen. I am an intermediate user that needs to have the ability to understand how our client's campaigns are performing at a glance. Everything I need to be able to access quickly is right at my fingertips. Cons: Continue to enhance the visual nature of the reporting - it is good now still, however, this is the one area I would like to see continue to evolve. Pros: The software is very intuitive and saves my team so much time by bringing insights right to the top and the 20 minute work week is awesome! Cons: I don't know that there is anything I don't like. I guess it only works for Facebook if you're doing social media ads, but that's what we mostly do. Overall: It's saved my team a lot of time. The copy ability is amazing and the ability to split ad groups without a huge messy project is fantastic. Pros: WordStream is intuitive and easy to use. The pricing is very inexpensive when compared to the cost of PPC Firms/Analysts and seems to be optimizing on a weekly basis. Cons: WordStream would be slightly improved if the 20-Minute Work Week function was available to generate suggestions on a daily basis rather than weekly. Overall: WordStream helps us budget correctly and analyze where its best suited to increase or decrease ad spend.